Diabetes is the most common disease which affects many people. Diabetes also leads to several other serious health problems including heart disease, blindness, kidney failure, etc. To prevent all these problems we have to know about diabetes and why it is caused, how to control it. Like this the more we know about diabetes, the better we can manage or prevent diabetes from affecting us. This article presents you the difference between Type-1 diabetes and Type-2 diabetes . Diabetes is the condition which occurs when the glucose levels in the blood are too high. Diabetes can also be defined as a condition which occurs when the sugar levels in the blood are too high. The another definition which we can give to diabetes is a chronic metabolic disorder occurs due to alterations in fat, protein and carbohydrate metabolism. Glucose is the sugar which is obtained by the body from the food we eat and is also made by our liver and muscles. The glucose present in the blood is the main source of energy for the body. Blood flows in our body to carry the glucose to all the body’s cells for the creation of energy. There is an another term which we all should be aware of is “Pancreas” an important organ in our body. It helps our body by doing digestive functions. It releases a hormone called “Insulin” into our blood. Insulin which is present in the blood helps to carry glucose to all the cells of the body. Sometimes pancreas do not release enough insulin into blood or insulin doesn’t work the way it should. This results in high level of glucose in the blood because there is not enough insulin to carry the glucose for body cells. which results in Diabetes. The glucose which is present in the blood has a value which is considered to be normal and the values which differ with the normal values shows the diabetes levels of the person. The following table gives a clear picture of Normal blood sugar values at different times of the day. Type-1 Diabetes is also called as 'Juvenile Diabetes' as it occurs commonly in young people. Type-2 diabetes is called as 'Adult-Onset Diabetes' as it occurs normally in middle-aged and older people. Type-1 Diabetes is caused because our body no longer produce insulin or it doesn't produce enough insulin because of the destroyed immune system. Type-2 Diabetes is caused because of the insulin resistance which is characterized by not using insulin by the fat, muscle and liver cells to carry glucose into blood cells for energy creation. Type-1 Diabetes is commonly caused due to autoimmune, genetic, and environmental factors, etc. Type-2 diabetes commonly caused due to older age, obesity, family history of diabetes, physical inactivity, etc. Type-1 Diabetes can also occur in older people, It is not limited to young people. Type-2 Diabetes can affect people at any age, even children. Type-1 Diabetes only account for 5 percent to 10 percent of all diagnosed cases of Diabetes Type-2 Diabetes account for about 90 percent to 95 percent of all diagnosed cases of diabetes. Type-1 Diabetes is effectively treated with insulin injections, maintaining the healthy diet, daily exercise or workouts, controlling cholesterol intake, maintaining normal Blood Pressure levels, etc. 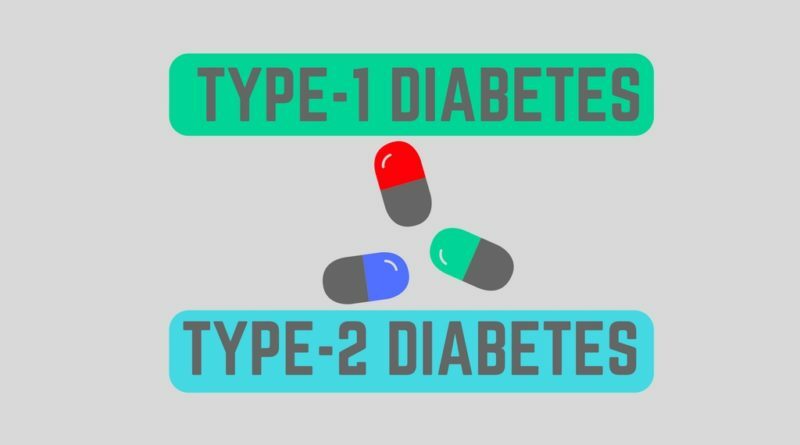 Type-2 Diabetes treatment is generally composed of oral diabetes medicines, diet control, physical activities, controlling cholesterol levels and Blood Pressure levels. ⦿ Skin problems like allergy and ichy skin. ⦿ Feel tired for no reason. The Diabetes is a chronic condition and the burden of living with a chronic illness is a consequence that is faced by every person who is suffering from Diabetes. Checking and monitoring blood glucose levels can help you to protect your health from serious health problems caused by diabetes and also to better manage your diabetes. If your blood has high glucose levels or low glucose levels, you may need a change in your diet plan, physical activities, or medicines.